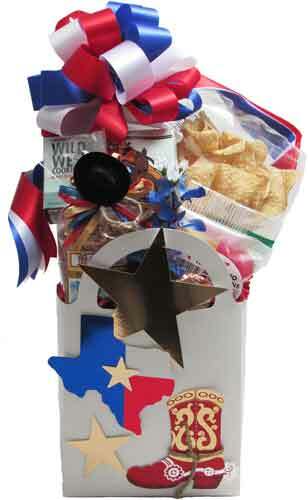 The container has a 3d effect with the Texas themed items on the front of it. Filled with restaurant style Lightly Salted Tortilla Chips, Texas Trail Snack Mix (topped off with a black felt cowboy hat, lariat rope, and bow), Salted Peanuts, Hot Chile Peanuts, Creamy Praline, and Cookies. Wrapped with crisp clear cellophane and topped off with a handmade bow. Includes a Greeting Card.